The day before they are set to leave, their beloved Grandpa Harry stops by. As a gift, he gives Ella a pretty journal since he knows she loves to write, and he gives Ethan a gold coin that Ethan decides he will always keep in his pocket. But the morning of their departure, Ethan realizes he's lost the coin! Together, he and Ella must retrace their steps from the day before. 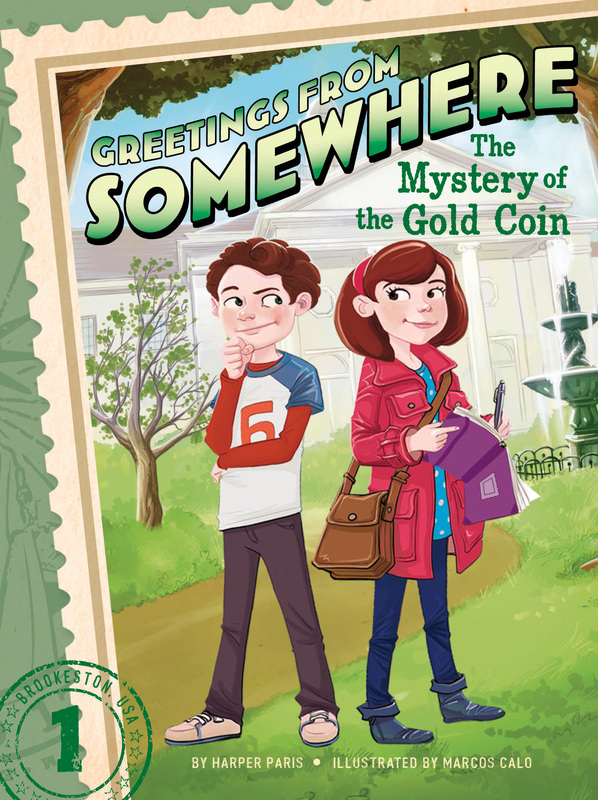 Will they solve the mystery of the missing coin before it’s time to head to the airport? “So what’s the surprise?” Ethan Briar asked. “Yeah, what is it, Mom and Dad?” Ethan’s twin sister, Ella, chimed in. Their mother, Josephine, smiled nervously. Their father, Andy, reached over and squeezed her hand. Ella tried to guess what they were going to say. Was it going to be a new puppy? Or maybe cool matching bikes? “Ta-da! We’re moving,” Mr. Briar announced. “You mean to a new house?” Ella asked, confused. “So why do we have to move? The Brookeston Times is in Brookeston,” Ella pointed out. The Times was their town’s newspaper—everyone read it. “Foreign, like, another country?” Ethan asked. “Wait! Did you say next week?” Ella interrupted. “Yep. We’re leaving next Sunday,” Mrs. Briar said. “And our friends? And Grandpa Harry? Will we be able to visit them?” Ella asked. “Someday. We’re just not yet sure when,” Mr. Briar finished. Ethan put his fork down. Ella had lost her appetite, too. “Do they have soccer in China and France?” Ethan cut in. “Yes, of course! And as for school, we’ve already spoken to Principal McDermott. I’ll be homeschooling you both,” Mr. Briar went on. Mr. Briar was a history professor at Brookeston University. He was supersmart. He knew stuff like who invented the boogie board (Tom Morey) and the name of the first king of England (Egbert). Still, Ella could not imagine their dad being their teacher. He didn’t sing silly “good morning” songs like their real second-grade teacher, Mrs. Applebaum. And he didn’t serve green milk on St. Patrick’s Day, either.